It's a fantastic live release documenting a superb tour. The playing is superb (you'd expect nothing less from either Joe Bonamassa or his very talented band), and the vocals are great too. This may well be my favourite Bonamassa live album to date. I love the fact that when he’s not busy recording his own music or doing tours of it, Joe Bonamassa does tours or live shows paying tributes to some of the great artists that inspired him. Doing that helps bring their work to a new audience and helps modern audiences become more familiar with the Blues pioneers. In recent years he’s done live shows that have paid tribute to the Three Kings – Freddie King, Albert King and BB King as well as Muddy Waters and Howlin Wolf. These have been subsequently released as DVDs or live albums. Now there’s a new release to add to the list – “British Blues explosion Live”, which sees him pay tribute to legendary British guitarists Eric Clapton, Jeff Beck and Jimmy Page. The tour that was filmed and recorded for this release was a short one, just 5 dates in 2016, with the sold-out show at the Greenwich Mean Time festival at The Old Royal Naval College in London on 7th July 2016 being the one recorded for this release. Joe Bonamassa wouldn’t be able to do these tributes so successfully if not for his ability to adopt the playing styles of the guitarists he pays tribute to. If he were to simply play their songs in his usual style then you’d notice the differences between his version and the originals far more, and there’d be a lot less of a difference between his own material and the covers, but because he’s so good then he varies how he plays depending whose material he covers. For that reason there’s far more difference between his tribute shows and his normal shows, and for that reason I never get bored of his releases. Another aspect I enjoy with Bonamassa’s tributes – he doesnt take the lazy way out and cover the hits, which are obviously the songs people know best – instead he may do the odd well known song, but he also picks out lesser known songs to cover – a good example here being his choice of Led Zeppelin’s “Tea for one” rather than one of their hits. It’s a fantastic live release documenting a superb tour. The playing is superb (you’d expect nothing less from either Joe Bonamassa or his very talented band), and the vocals are great too. 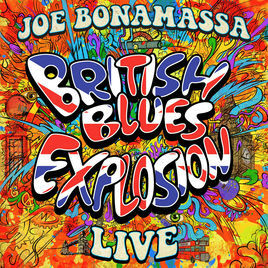 This may well be my favourite Bonamassa live album to date.